Apply to Herkimer College for a high-quality education from a school with top-ranked graduation and transfer rates, a great campus, low tuition costs, and amazing athletics. Our Mission: Community, Excellence, Integrity, Opportunity. Meet the Esteemed Herkimer College Faculty. Integrity, Innovation, & Exceptional Academics. The Herkimer College faculty and staff are the heart of our campus community. Without you, we would be unable to advance education, offer life-changing opportunities, provide unparalleled student support, and impact the region. We strive to be an outstanding place to work. With great benefits, state-of-the-art facilities and equipment, a friendly atmosphere, and a variety of events and activities, our aim is to maintain a work environment where employees are prosperous and happy. We hope you are as proud to be a part of the Herkimer College community as we are to have you in it. 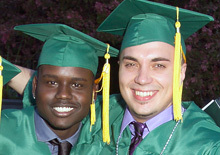 Together, we create the premier two-year SUNY experience – right here in Herkimer County. Reach out and connect with faculty and staff. View the job opportunities available at Herkimer College. Find the contact information for the offices that can help you. Check out upcoming events at Herkimer College.